Conservative Hangout: Caitlyn Jenner IS A Hero - But, NOT A WAR HERO! Different Kinds Of Heroes CAN Exist In Our Society. Caitlyn Jenner IS A Hero - But, NOT A WAR HERO! Different Kinds Of Heroes CAN Exist In Our Society. I was born in the early 1970's. I don't remember Bruce Jenner's performance in the Olympics where he won the decathlon and was declared the "greatest athlete of all time" (for winning the decathlon -- apparently, this is "declared" every 4 years at the Olympic decathlon.) No offense to current decathletes, but, who cares? You go on ahead and push yourselves to your bodily limits and look down on the rest of us slovenly beings. You're probably justified in doing so. I've seen many Facebook posts about "what a freak" Bruce/Caitlyn Jenner is now. I get it. He/she is DIFFERENT from you. Um, he/she is DIFFERENT from me...and, I'm gay! So, WHY is he/she "included" with the "LGBT" community? Tonight, I finally "got it" - as a gay person - why the "trans-gendered" are included with the lesbos and with the fags...it's because the trannies are "different", too. (For anyone to dispute such a thing would make them a BIGOT, right? Surely they'd be labelled a "homophobe" for calling someone a FREAK, right?) I know I'm not supposed to use the terms I just used.....but, why should I not? Hundreds (most likely thousands) use those words to describe "us" every day. Why should it matter that I, a female fag, does so? 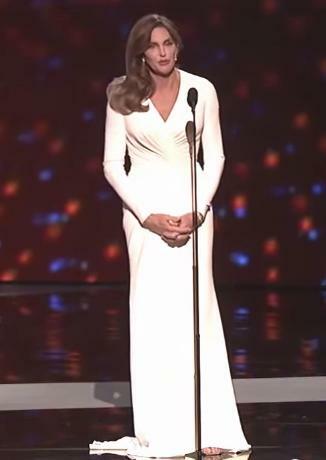 Below, you will find the video of Caitlyn Jenner accepting the ESPY award for "courage in sports" (notice that it's not the award for "courage in war").....just so we're clear on that. "And, certainly last, but not least, my mother. My mom, who just over a week ago, had to have surgery and (she) didn't think she was going to make it. But, she's here with me tonight to share this night. "You know, I always thought that I got my courage and my determination from my dad who landed on Omaha Beach (and) fought all the way through World War II. But, (do) you know what I'm realizing now mom? I think I got all of those qualities from you. I love you very much and I'm so glad you're here to share this with me." "You know, it is an honor to have the word "courage" associated with my life. But on this night, another word comes to mind...and, that (word) is "fortunate". I owe a LOT to sports." If you are not an ACTUAL WAR-TIME SOLDIER (past or present) I don't believe that you can relate to the WORD "courage". AND, IF YOU ARE, it's a different kind of courage that it takes to hunt and kill people and protect your friends and preserve your mission than it does "out" yourself as being an individual who is "different from the rest of the herd" in day-to-day "civilian life". I believe that every person with a brain can clearly make the distinction between the two "types" of courage. When one of your friends "outs themself", it is a ONE TIME experience for you. FOR those of us who have to "out ourselves", it's an experience that will likely continue for our entire life. It doesn't matter how many people we've "outed" ourselves to in our own life, there will ALWAYS be someone who "hadn't heard that before". As a friend once told me, "Coming out isn't an 'event', it's an 'experience' that lasts a lifetime." I am gay. I'm a gay, conservative female. I've put myself out there. And, I don't do so anonymously. I fight ISIS online. I've stood up for conservative causes online for YEARS. I LOVE SARAH PALIN (and, I've got a license plate that proves it!) I've got several YouTube channels. I've got more than 2 blogs. I have several Facebook accounts.....but, THANK GOD, I've still only got the ONE Twitter account (because I despise Twitter - I only use it out of necessity). Why is it that some conservative, gay woman is working HARDER than YOU are for the future of America? You won't be able to BLAME ME for ANYTHING. I've got the record to back-up what I've done. What have you done? What are you doing? If you don't feel you can participate in anything ONLINE, you CAN certainly encourage those who KNOW NOTHING about "current events" to "NOT VOTE." Our founders made damn sure you have that right.